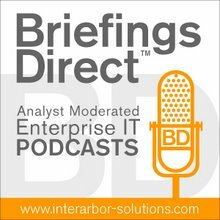 The next BriefingsDirect big-data thought leadership discussion highlights how fast analytics -- or getting to a big data analysis value in far less time than before -- expands the market for advanced data infrastructure to gain business insights. We'll learn how bringing analytics to a cloud services model also allows smaller and less data-architecture-experienced firms to benefit from the latest in big-data capabilities. And we'll explore how Dasher Technologies is helping to usher in this democratization of big data value to more players in less time. To share how a fast ramp-up for big data as a service has evolved, we're joined by Justin Harrigan, Data Architecture Strategist at Dasher Technologies, as well as Chris Saso, Senior Vice President of Technology at Dasher Technologies in Campbell, California. The discussion is moderated by me, Dana Gardner, Principal Analyst at Interarbor Solutions. The two factors are the value to the business. If you're a large enterprise and you implement big data, and it gives you the ability to make decisions and quantify those decisions, then you can put a number to that and see how much value that big-data system is creating. For example, a new marketing campaign or something you're doing with your remote sites or your retail branches and it’s quantifiable and it’s having an impact on the business.